Editor’s Note: This article is brought to you by a guest writer named Ulrik. I’d like to thank him for contributing this article about suggested changes to balance the early card pool. 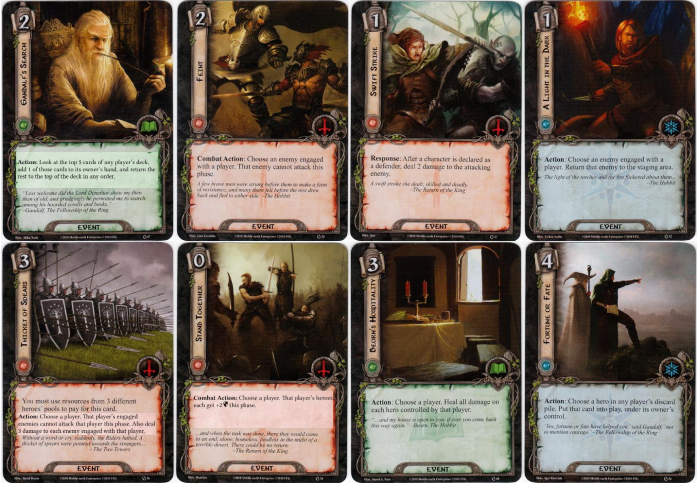 Imagine this: when deck building for your upcoming adventure in Lord of the Rings: The Living Card Game, you have one slot left for your deck. You desperately need something that can handle locations in the staging area, and your choices have been narrowed down to either Northern Tracker or Power in the Earth. Unless we have set upon ourselves harsh restrictions, everyone would – without hesitation – choose the Northern Tracker. Now, wouldn’t this deck building experience have been much more interesting if the choice between these two cards was more difficult? What if both cards were of roughly equivalent strength? I am a casual player, quite satisfied with only owning a single copy of the Core set as well as the Mirkwood cycle. 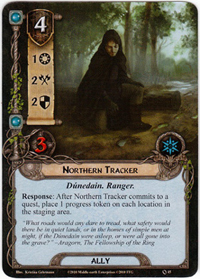 In such a limited pool of player cards, having the Northern Tracker always triumph over Power in the Earth greatly impacts the deck building aspect of the game. For me, one of the strengths of this game is the deck building aspect. Sorting the cards by type and cost, and then spending a considerable time pondering over which ones to include for the chosen scenario. This process is hampered by the huge discrepancy in power between Northern Tracker and Power in the Earth (or, for that matter, any other location control option in the Core Set and Shadows of Mirkwood cycle). For that very reason, I have set myself upon the quest to try and re-balance the notoriously over-powered player cards, as well as tweak and boost the embarrassingly under-powered cards. My aim is for a more balanced power level of all the available player cards. The end goal is a situation where next time I am creating a deck to face the many perils of the Middle Earth, the choice between Northern Tracker and Power in the Earth is neither obvious nor easy. Ideally, they can stand roughly shoulder to shoulder in power level. The overall power level of the player deck should preferably stay the same as before. 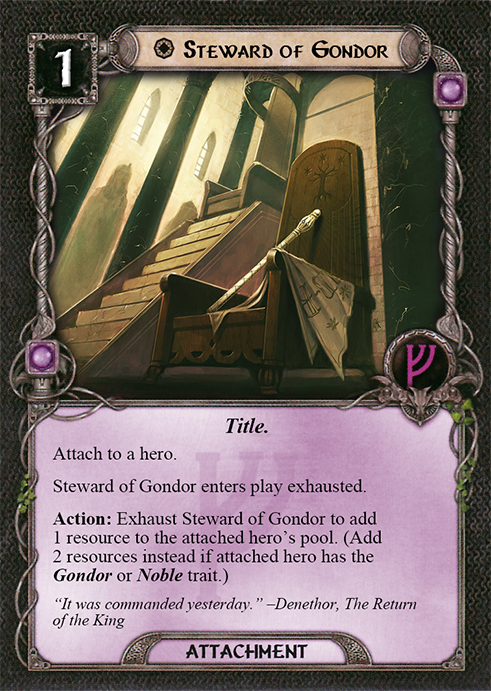 Thus, by toning down for example Steward of Gondor, it is important to simultaneously level up weaker resource-accelerating cards to maintain an adequate power level and game balance. 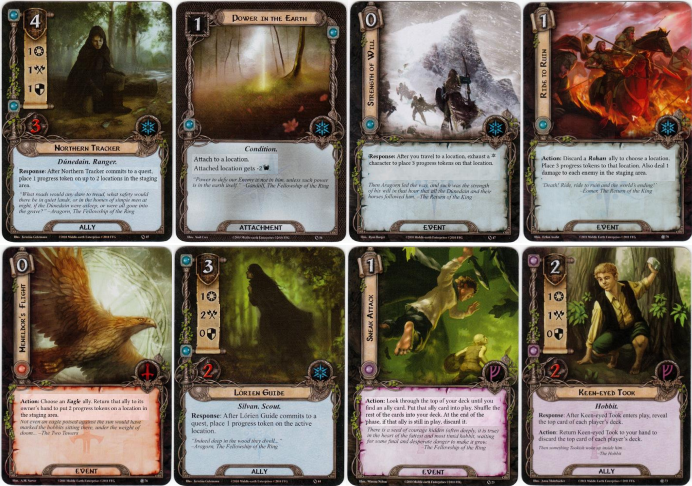 I will only take into consideration the internal balance of the cards within the Core set and the Mirkwood cycle. For example: it does not matter if my altered version of Rain of Arrows is absolutely busted with Outlands or Ent decks, as those decks are not part of this limited environment. Some cards will still be stronger than others. The goal is not to make all cards identical, but to make the choice between cards to solve a given problem more interesting. For example: Erebor Hammersmith likely is a stronger card than Second Breakfast, but they are both within the realm of reasonably playable and interesting within their respective spheres. For this first session, I will focus on the worst offenders in terms of power level, whether under-powered or over-powered. Altering cards can be time consuming and difficult. Therefore, any changes should be as straightforward as possible. Most changes will be as simple as lowering or raising the cost of player cards, altering the stats of allies, and only very rarely will I alter any part of the card’s text. In those circumstances, the changes should be as small as possible. Personally I’ve done most changes easily enough with a scanner, a colour printer and some paper-friendly glue. To each their own. Choose freely whether to be inspired or disregard any or all of the ideas presented in this article. One of the great things about cooperative and solo games is that you can apply house rules without affecting the way that others play. With all that said, let’s get the most obvious elephant in the room out of the way first. I’m looking at you, Steward of Gondor. The Steward of Gondor (or Consul of Gondor as I call it to bypass the thematic problems) is by many players admittedly problematic, as it is so strong it virtually warps the entire game experience around itself. The difference of having a Steward of Gondor in play or having to go by without it is often night and day. The card is so powerful; it even forces itself into decks which don’t include Leadership heroes! No, that simply won’t do! My solution, as simple as possible: First I weaken Consul of Gondor so it only gives 1 resource per turn (instead of 2). That’s it. Now, the card is still strong, especially over a long game, but not ridiculously over-powered. 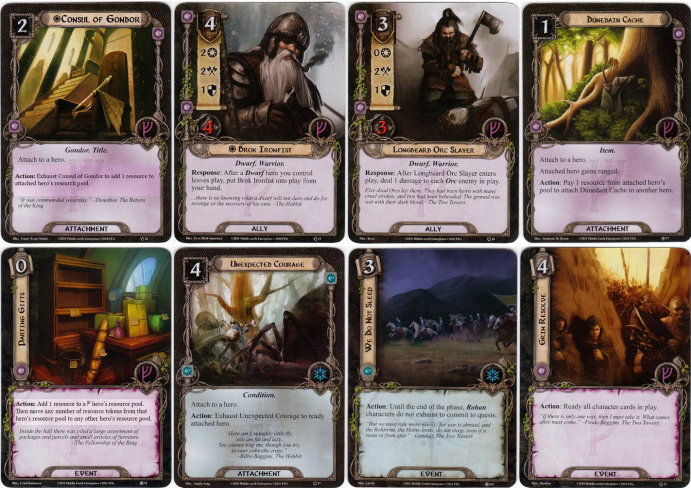 To offset the smaller income of resources given with the new version above, several formerly over-costed Leadership cards are made cheaper: Brok Ironfist down to 4, Longbeard Orc Slayer down to 3, Dúnedain Cache down to 1. Furthermore, the formerly useless Parting Gifts receives an additional line of text, in that in addition to its usual effect, it also adds a free resource to the hero before any transferring of resources. 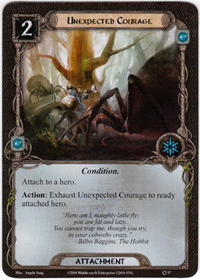 Another one of the super-powered cards, the Unexpected Courage is ironically one of the most expected cards to show up in any Spirit sphere deck. By doubling the cost of this alluring attachment from 2 to 4 however, it becomes less of an auto include. I think this cost better represents the card’s very powerful effect. Again, to offset the decrease in power level from the former all-star card, other cards that offers readying effects are boosted: We Do Not Sleep has its cost lowered to 3, and Grim Resolve is lowered to 4. And as a side effect, other fairly costed cards like Westfold Horse-Breaker, Ever Vigilant and Common Cause will by themselves get a bit more playable with a somewhat less desirable Unexpected Courage. If there is any ally that can ruin the challenge of an adventure, it is the Northern Tracker. You grab the game box from the shelf, clear the gaming table, sort all of the cards, spend half an hour or so to build your deck, and another half an hour preparing the encounter deck and some fitting background music, only to have the Northern Tracker totally dominate and trivialise the entire adventure within a couple of minutes. Solution: Limit the skilled Tracker’s ability to place 1 progress on up to 2 locations each time he commits to a quest. Also, not that it really matters since he is almost always questing, but let’s lower the attack and defence values of the Northern Tracker to 1 each (instead of 2). Now, with the Tracker pulled a bit down to earth, others need to step up to the challenge. First off, Power in the Earth subtracts -2 threat to the attached location (instead of -1), and Strength of Will places 3 progress (instead of 2). Two more cards receives an additional line of text: Ride to Ruin (in addition to placing progress to a location, also deals 1 damage to each enemy in the staging area), Meneldor’s Flight (in addition to bouncing an Eagle back to your hand, also places 2 progress on any one location). Finally, the formerly overlooked competition to Northern Tracker, Lórien Guide, gets +1 attack. This, along with the Silvan trait, should differentiate its to the now less combat proficient Tracker. This elven scout is probably still a weaker ally than the Dúnedain tracker, but now it’s a bit more of a contest. Now this is a tricky one. Sneak Attack by itself is not really problematic or overpowered. But since the very dawn of this game, Sneak Attack and Gandalf (and occasionally Beorn) have gone so tightly hand in hand, to the exclusion of almost any other ally. Squeezing as many uses as possible of old Gandalf has always been a strong and viable tactic. Too strong, I would argue, since it severely limits deck building options, which of course just won’t do. So the effect is still powerful, it is just that little extra matter of making sure what ally is on top of your deck. A task the formerly useless Keen-Eyed Took certainly can help out with (which, on a bit of a whim, I have boosted by +1 Attack value). 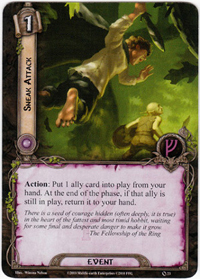 Other choices include a fixed Gandalf’s Search which in my altered version costs 2, but allow the player to look at the top 4 cards of their deck, making it a quite nice tool indeed with this new version of Sneak Attack. Feint is another difficult card to change. It is not at all on the ludicrous power level of Steward of Gondor or Unexpected Courage. Plus, it’s quite an essential asset for the Tactics deck. The good thing is, that the Tactics sphere actually has quite a few similar cards, albeit much weaker so they used to all stand in the shadow of the all mighty Feint. First off, let us grant a small price increase to Feint, from 1 to 2. In contrast, lower the cost of both Swift Strike and A Light in the Dark to 1 (from 2), and give A Thicket of Spears the following extra effect: “Also deal 3 damage to each enemy engaged with that player” (thematically representing the heroes each having a spear). Finally, the overly complicated Stand Together is changed to have the following ability (still at a cost of 0): “Combat Action: Choose a player. That player’s heroes each get +2 Defence this phase”. Getting two extra shields for a phase is surely a strong effect, yet, everyone knows the inherent risks of using heroes to defend. 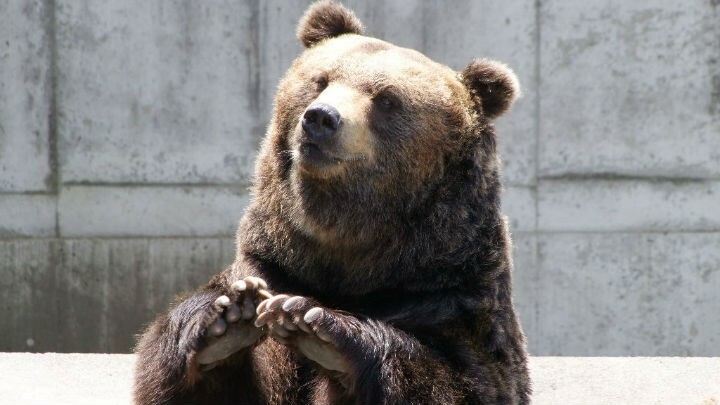 From different spheres, but worthy of consideration, Beorn’s Hospitality is lowered to cost 3 (from 5), and Fortune or Fate is lowered to 4 (from 5). These changes offset the fact that heroes become more vulnerable when Feint is more expensive and somewhat less commonplace. So, this was the first stage of our quest. Below you will find the cards discussed in this article. In future articles we can continue re-balancing player cards, even bringing our attention to the heroes. Until next time, farewell! 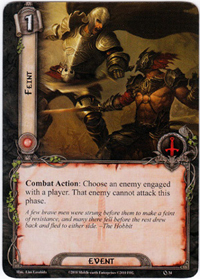 This entry was posted in Card Lists, Community, Custom Cards, Discussion, Game Variant, Guest Author, Metagame, New Players, Opinion and tagged Early Card Pool, Fantasy Flight Games, Feint, Living Card Games, Metagame, Northern Tracker, Over-powered Cards, Rebalancing, Steward of Gondor, The Lord of the Rings LCG, Under-powered Cards, Unexpected Courage. Bookmark the permalink.